NEW YORK -- Sears Holdings' sales are slipping faster and faster. The retailer Thursday reported declines in comparable-store sales at its Kmart and U.S. namesake chain for the crucial holiday season that were even sharper than for the third quarter. At its U.S. Sears stores, sales at stores open at least one year, an industry benchmark known as comparable sales, were down 9.2 percent in the nine weeks that ended Jan. 6 and down 5.7 percent at the discount Kmart chain. Sears (SHLD) shares were down 13.4 percent at $36.85 in after-hours trading. Sales at the company have been falling since 2005, when billionaire hedge fund manager Edward Lampert merged the two U.S. chains in an $11 billion deal. The retailer has closed about 300 U.S. stores since 2010, tightly managing inventory, selling real estate and shedding assets at home and in Canada as it tries to engineer a turnaround. %VIRTUAL-article-sponsoredlinks%The company has about 2,000 Sears and Kmart locations in the United States. "The results that we posted are not nearly what we want them to be," Lampert, Sears Holdings' chief executive officer and top shareholder, wrote in a blog post. The company has made a big bet that its strategy to make targeted offers through digital and social means to members of its "Shop Your Way" rewards program, which generated about 69 percent of holiday sales, can fix the company. In his blog, Lampert lamented that the holiday results "overshadow" the progress Sears had made with the program. Lampert told Reuters in November he saw room for further store closings in 2014. "They're not focused on executing at retail so that's why we've seen the business deteriorate," said Mary Ross Gilbert, a managing director at investment bank Imperial Capital. Imperial has an underperform rating on Sears shares and a sell rating on its 6.625 percent bonds. Gilbert said that despite the holiday results, the company had enough liquidity in the near term. Retailers faced the most promotional holiday season since the recession, trying to outdo one another with deep discounts to lure shoppers, adding further pressure to Sears and Kmart. As a result, a number of retailers cut their profit forecasts on Thursday. 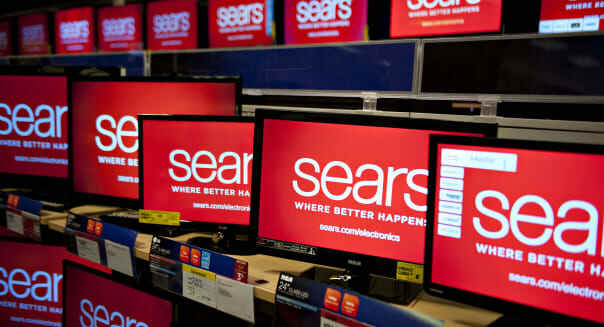 Sears said it expects to post a lost of between $11.85 and $12.88 a share for the fiscal year ending Feb. 1. That includes a loss of $2.35 to $3.39 a share for the holiday quarter. At Kmart, business fell in consumer electronics, groceries and toys, while at Sears it was down in electronics as well as home appliances, among other categories.